Above Video: John McCrea and long term friend Joseph Smarr (He knew me way back when I was Hitachi’s community manager) and I…ahem yes, Mr Spock too, chat on Social Web TV at Plaxo, one of the companies I interviewed for the report. The Viddler player is social in itself, you can leave comments, tags, or hyperlinks in the segment itself, yup, I’m Viddler’s evangelist Colin Devroe’s baby daddy, you won’t be surprised to find out that is one ugly baby. The blog post covering the recent release of the report The Future of the Social Web continue to radiate across the web –with interesting discussions, questions, and comments. Also, I was asked do I keep track of the accuracy of my predictions? The answer is yes, we self-graded our predictions from 2008, and are keeping ourselves accountable in this transparent world. It’s important to note that no one can predict the future, so that’s why we did research and interviewed the top minds at the top companies, what we compiled is the most accurate lens to what’s going to happen that anyone’s been able to package into a report. I’ve also started a running list of examples in the five eras of the social web, so we can watch how it unfolds. I write to you from Amsterdam, as I trek the globe sharing the five eras of the social web research, I look forward to coming to your conference or company to present. Dutch Fond Of Social Technologies, But Why? View more presentations from jeremiah_owyang. Above: Social Technographics of Netherlands, see other global data for free at Forrester’s Technographics Profile Tool, for our clients we can cut this data in a variety of ways by role, region, and sometimes affinity. I’m an American social computing analyst in the Netherlands –which gives me a unique perspective to peer into the adoption and culture of social networks. I’m here in the center of Amsterdam, overlooking a canal. Yesterday, I presented the above social technographics of the Netherlands at the Corporate Social Networking Conference, and talked about the future of the social web, MarketingFacts live blogged it in Dutch, but you can try the Google Translator (although I’m told the translation gives some comedic interpretations). Although the Netherlands are a smaller country compared to many, their adoption of social technologies is significantly higher than their neighbors –and many other cultures across the web. Last night, I met Patrick, the founder of a European social media blog The Next Web, (smaller, but similar to Techcrunch), and Raymond, the founder of Hyves, the most popular Dutch social network. We discussed why the Dutch have an affinity towards social technologies on the local news (called BNR) listen in to this 23 minute clip of social networking in Netherlands. Apparently, I was the first to bring this program to be spoken in English rather than Dutch, I wonder how the loyal listeners will react. For my research, I interviewed Raymond last night, one of the Hyves founders, I learned this SNS was founded in 2004, and was inspired by Google’s Orkut, he mentioned Cyworld a few times, also a regional SNS from South Korea. I learned that up 50% of the Dutch population could be on Hyves (although some may have double accounts) for a total of 8 million accounts of a total population of 16 million, and 60% of the Dutch population visits the site at least monthly. Brands are waking up to this, and there have been marketing efforts from Unilever, KPN, Vodafone, and Bacardi. I’ve created a Hyves account (Hyves, like in bee “Hyve”) to learn more about how these tools are being used, if you’re already on, you can add me as a friend and I’ll add you back. A few key features that are interesting: There’s a way to enter your license plate number, and search for others. Secondly, a premium feature you can pay for is to have some abilities to have analytics, and see who’s looking at your profile. This network appears to be geared towards a younger generation that wants to socialize and connect, although the numbers suggest it’s gone mainstream across many age groups. Strong web based infrastructure, availability of high speed networks and access to wireless. Mobile based culture where most citizens have smart phone devices with web surfing ability. A culture and government that encourages independent thought and freedom of expression. Social acceptance of sharing, learning and collaboration. It would be rude for me to assert any cultural observations, so if you’re Dutch, I’d like to hear your opinion. What else would you add to these proposed criteria, or does each culture have a unique set of factors that governs its social technology adoption? Left: Dr. Urs Gasser of Harvard’s Berkman Center, who focuses on Digital Natives. I’m live blogging from Corporate Social Networking Conference in Amsterdam, and listening to Dr. Urs Gasser of Harvard’s Berkman Center, his website and twitter account (works with friend Doc Searls) who coined the term “Digital Natives”. In my opinion, the Berkman Center is the leading think tank in academia focused on the internet and impacts to culture. The kids born after 1980 are often thought of as Digital Natives but age doesn’t always matter as the generation is defined on: access to digital technologies since birth, age, and have the skills to use the digital technologies. Those who come before these digital natives are referred to as digital immigrants. For what it’s worth, I’m right in between both, giving me a perspective of both worlds. They interact with the peers across the globe: This impacts employers, brands, teachers, parents, as this first generation enters the workforce. Multiple identities, personal and social, shared online and offline (blurring): Online representation is the same as physical representation: what your clothes, friends, vehicles say about you. Extensive disclosure of personal data: 35% of girls in US are writing a blog vs 20% boys. Opportunity for HR departments to learn more about their employees, but guess what? They Google you too. Culture of sharing: The default behavior is information sharing, not only do they have the right to speak, but to be heard. Risk: breach of confidentiality is hip, digital natives are fans of wikileaks. Creators, no longer passive users: This generation creates their own content and shares their opinion online, see the Forrester’s social Technographics to learn about the data. Information processing habits: Pointed out that the second most popular social network was YouTube. They often ‘graze’ the headlines and don’t often read the full article. (I guess few natives will read this far? Prove me wrong in the comments). Opportunities: companies should allow natives to increase creativity to rip, mix, burn content to encourage interaction. Peer collaboration, online activism: They often experience work with community builders, and are responsive to intrinsic motizations. 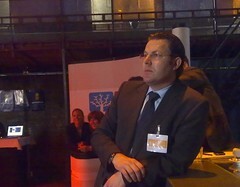 Pics from the event, at a converted industrial complex westergasfabriek “Western Gas Factory”, extremely hip venue. This by no means represents all brands, but just some brands, perhaps those that are a bit more sophisticated. Last Friday I had a conversation with a manufacturing firm that had some relativily sophisticated questions about how they will prepare their plan around Twitter. This was a nice break from the “why does Twitter matter” questions I usually get, as they were thinking through a plan. Should we create multiple accounts for different divisions? How should we name them? How should the content be different? Is it ok to just tweet out news on our main corporate account? Or should we be conversational? How do we get our corporate reps (sales, product teams) to use this tool, and be conversational? What are the tools to use to manage multiple authors/tweeters? How can we find other examples of B2B twitter examples? How should we brand our Twitter backgrounds images? Ok, that was more than 8, but I grouped them into related questions. It was refreshing to hear this much thought being put into their conversational efforts, this was actually a manufacturing firm, not a high tech company and certainly not a young startup out of southpark in SF. In general, the level of interest has gone up about Twitter since late Q4 2008 from my clients, and recently, we’ve been getting more questions about the topic. What questions are you hearing from brands that are approacing Twitter? I gauge the level of sophitication of a brand by which of these five questions they’re trying to answer, just change out ‘social media’ to ‘twitter’ to gauge. Are you at an agency or at a brand? What questions are you hearing about Twitter? Update: Antonio has answered, as has Jess, and so has Dirk who heads social media marketing at Vignette. Gotta have some fun, hope you had a good laugh at this ever relevant Twitter video. It’s rather on point, as I recently listed out what happens to Twitter as it gets mainstream attention (although it doesn’t have mainstream adoption). Here’s the first twitter video from the supernews folks –they’re having a lot of fun. Video: see Get Glue’s demo reel, embedded above. Summary: Young startup Get Glue is the early steps of how every product and website will be social –impacting recommendations and marketing. It ushers us into the early steps of the Era of Social Colonization, the third era of five in the evolution of the social web. Last week I spent time with small Get Glue team on a briefing, they were recommended to me from former colleague Charlene Li, so if she suggests something, I’m going to quickly follow up. It’s rare that I would dedicate a blog post to a company from a briefing, but this one is significant. Get Glue is meta social network, meaning it aggregates the explicit and implicit behaviors of other social networks. Example: If you leave ratings about products on different websites, it will start to aggregate it to one page. What does this mean? It means that Get Glue can aggregate the opinions of your friends about nearly any product. Early example, yet not maturity: Although this is focused on media, movie, music, gadgets and more, expect it to grow it’s scope to include services, restaurants, and even enterprise products. Barriers to mainstream adoption It requires users to use a Firefox plugin to enable, so it’s only reaching a limited number of people –and they have to be active in social networks. Recommendations will be aggregated: Soon, every product, webpage, and service will be rated by your friends, and the information will easily be aggregated into one location. Silos break down, as Get Glue is pilfering the reviews from thousands of sites to create a unique database with all the social data. Significant impacts to marketers: You cannot stop this, and marketing as we know it will have to switch to a focus on social recommendations.